(Česky) EPNEV 3.18 – povelový přijímač eth. Platoon of cars ready before the test ride (3rd vehicle is our car) - taken from the press release of Testfest. During the last week, from April 23 to April 26, we successfully participated in the Intercor PKI Testfest, which took place in the city of Reims, France. The goal of the event was to test an internation interoperability of V2X services in terms of security. This was the first public and open security test in Europe. Teams from 11 states participated in this event and brought 22 On-Board Units (OBUs) and 12 Road-Side Units (RSUs). The participants were mainly the partners of the Intercor project, but other teams companies joined as well, in total 19 companies (including Renault and Peugeot). The test consisted in rinding a given 23 kilometer long circuit, which led through highways and also through city roads. There were 4 RSUs of the French road operator SANEF. These RSUs sent warning about non-standard situations using DENM messages (e.g., road-works warning, string wind, slow vehicle). The mesages were also sent from the SANEF vehicles (V2V), such as human on the road and stationary vehicle. The new on-board computer EPIS 4.0C. We finished the development of the EPIS 4.0C on-board computer that satisfies the new demands on this type of device. It is built on the 64 bit architecture, DDR3 memory, fast SSD discs, 1 Gbit/s Ethernet, USB 3, radio communication interface for analog, data or TETRA radio stations. The PC architecture ensures stable development of SW in the years to come. Its performance is 10x better than EPIS 4.0A or EPIS 4.0B and up to 100x better than the first type while being mechanically, connector-wise and SW-wise interchangeable with them. This shows us that the original conception of on-board computers was correct. To get more details about the demands on the new generation of on-board computers see the article here. We started a transformation of the form of the company from a natural person to a legal person -Herman systems Ltd. Considering the place of the company on the market, this is a logical step that ensures future continuity of the company. However the process is going to be long and complex. During the long-lasting history of the Ing. Ivo Herman, CSc. company, commitments and liabilities have been established that cannot be changed in a day. This also applies to the law and tax aspects of the transformation. We are also opening new primarily development premises of the company on the upper floor of the company building and in two extensions of the building. The overall space increase is about 1000 m2 and we invested more than 18 mil. Czech crowns in this reconstruction. We could not expand our company without this investment. 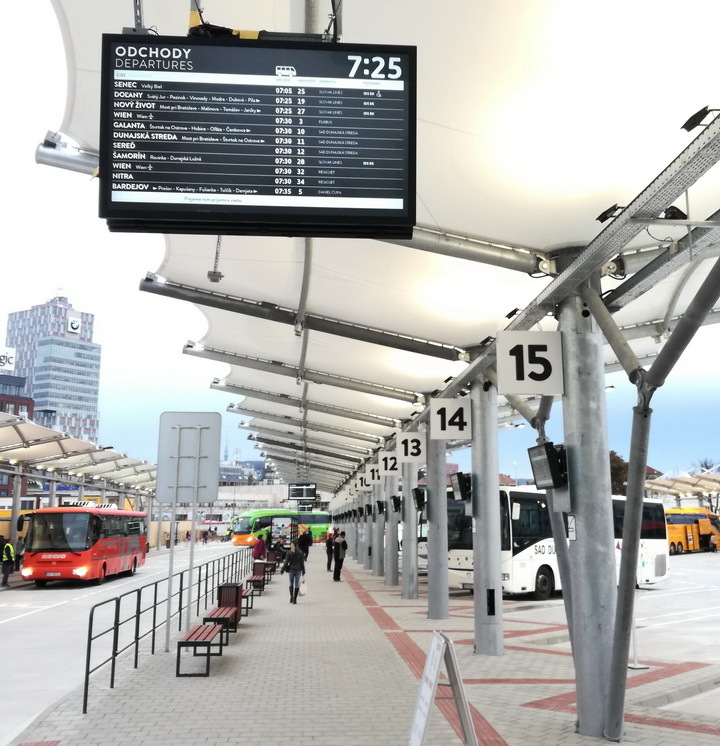 We provided complete outer information LCD display equipment for the substitute bus terminal in Bratislava near the Mlýnské Nivy street. This included 34 pieces of 32″ outer LCDs ELP 832A that are placed at each platform and display current departures. It also included 12 pieces of 55″ LCDs – type ELP 855A used as overview displays when going through the platforms. Two of these panels are always connected opposite each other creating a double-sided LCD set. One 65″ LCD – type ELP 865A was also included. It is going to be used as an orientation display and it’ll be installed standing (its anchor is being prepared). All LCDs are supplied in the new SLIM rendering (thin edges) with high illumination LCD displays min. 1000 Cd/m2, antivandal rendering and they are equipped with antiglare glass (antireflection). The LCD panels are equipped with display SW using the design by the Transdata company that supplied the control SW for the terminal. The panels are autonomous and they download departure data from the control server of the terminal. A departure panel in Bánská Bystrice. In just under three months we managed to prepare a new type of departure double-sided stop panel ELP 225B for the newly constructed transportation terminal in Bánská Bystryce (more about the terminal here). The panel is characterized by an illuminated platform number (e.g. 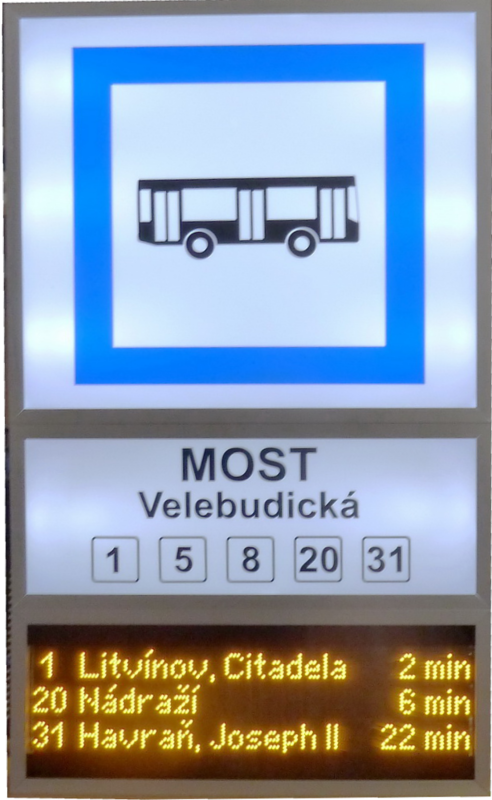 yellow – inter-city transportation, blue – suburban transportation, red – municipal transportation), a graphic LED surface for displaying bus departures, and a white time display. The supply also included information LCDs ELP 865A in the antivandal rendering and new SW Sprinter modified for transportation terminal control. The supply of 20 departure panels ELP 225B, 8x LCD 65″ in the antivandal rendering and the SW SPRINTER TERMINAL was produced and put into operation in just under 80 days including new mechanical solutions. New type of vehicle communication – V2X (C2X) is coming ….. Possibilities of V2X for public transportation. Our company has become one of the producers of units supporting the V2X (or C2X) communication. It is a vehicle-vehicle or vehicle-infrastructure communication based on the European standard ETSI ITS G5 and on the frequency of 5,9 GHz. This communication unifies the communication of a vehicle with its surroundings, i.e. both with other vehicles and with the infrastructure (intersection control units, intelligent signs, notifications sent to vehicles – e.g. to the EPIS on-board computers, communication with intelligent stop signs, manual or automatic throwing of switches, etc.). Both HW and SW components are fully controlled by our company which means that we can perform modifications on a request and supply custom solutions. These new V2X units unify our long-lasting efforts to create a unified vehicle communication device for medium distances that would broadcast the system state to the surroundings. We are preparing both a solution for vehicles (car unit) and a solution for stationary devices (RSU). These units will gradually become a standard in all motor vehicles and not only them. More information about the new units and systems will be published. We performed a repair and renovation of some of the outer LCDs of the transportation terminal Svinov where the large overview 55″ LCD panels (type ELP A855 EH) were damaged by a passing vehicle. Small stop LCD panels were insufficient for displaying departures which is the reason why double LCDs (type ELP D821EH) were rebuilt into triple LCDs (type ELP F821EH) while departures were divided between the individual LCDs based on the traction and transportation type. The front protective glass was replaced and the “antiglare” technology was used. This important technological innovation reduced unwanted reflections coming from the surroundings. We prepared a set for self-service passenger checking primarily for municipal public transportation or for smaller regional public transportation routes where passengers get in the vehicle through the front door and the driver has a responsibility (possibility) to check self-service passenger checking using an on-board computer. Actions performed by passengers while using the EVK 5.0 BP validator placed in the entrance area by the front door are displayed directly on the terminal of the on-board computer including card validity and coupon type information. 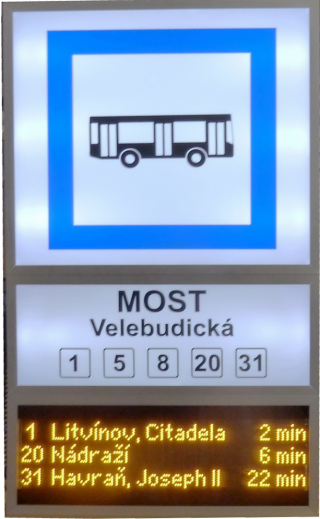 Passengers can do the checking themselves using a bank card or some of the known Czech public transportation cards (e.g. the Plzeň Card) The system is based on the EPIS 4.0X on-board computer and the EVK 5.0BP validator. The on-board computer contains a backup of the validator transaction database to increase reliability of the checking system. The EVK 5.0 BP electronic validator has undergone homologation for bank cards and the Plzeň card. It is possible to prepare custom solutions for other non-bank cards. The exact description of its behavior will be published within a week. 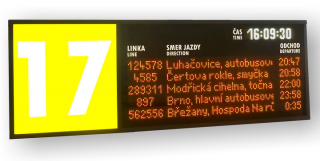 A new type of the compact integrated electronic sign ELP 173-01Px was developed as a part of the innovation of public transportation stops in Plzeň. 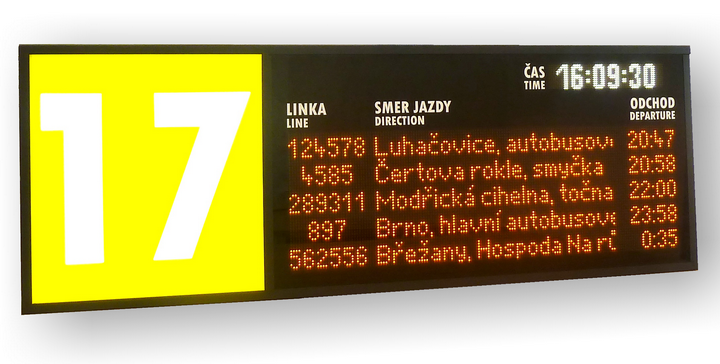 It displays current vehicle departures from stops and it also contains full standard equipment of large stop panels. This sign solution is characterized by 3.8 mm LED spacing first introduced at the international fair InnoTrans 2016 in Berlin. This spacing provides readability from the distance of up to 15 m in direct sunlight. The power consumption of this panel is decreased by half by using „black“ LED. 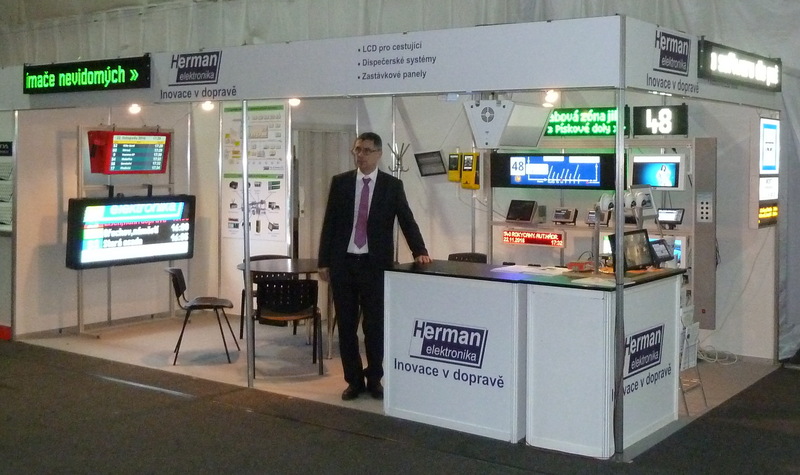 Another innovation in the Czech Republic is using lithium accumulators and power supply from public lighting. This makes installation and operation easier as it is not veccesary to build new access lines as it is possible to use existing public lighting power supply. ELP 832 VE for inner use. 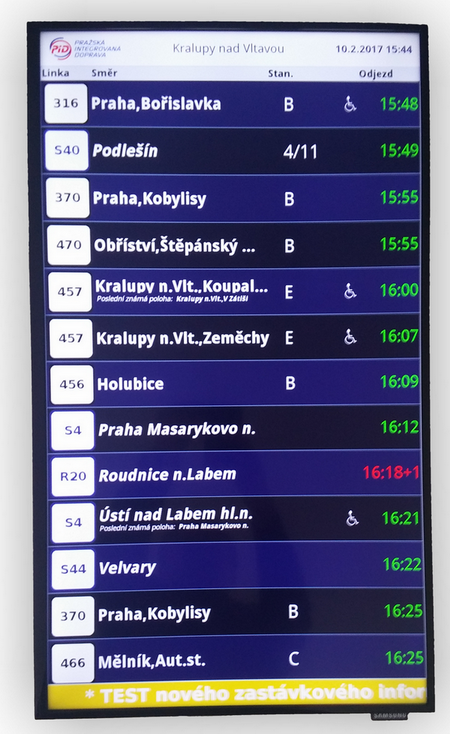 A new type of displaying of departure information was utilized as a part of the installation of a stop system into the building of ČD in Kralupy nad Vltavou. 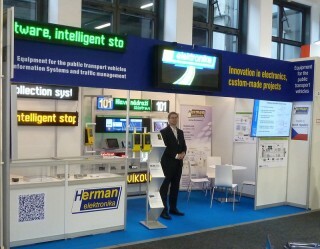 The installation was performed for the Prague integrated transportation. The information will be displayed on 55“ and 32“ new LCD panels. 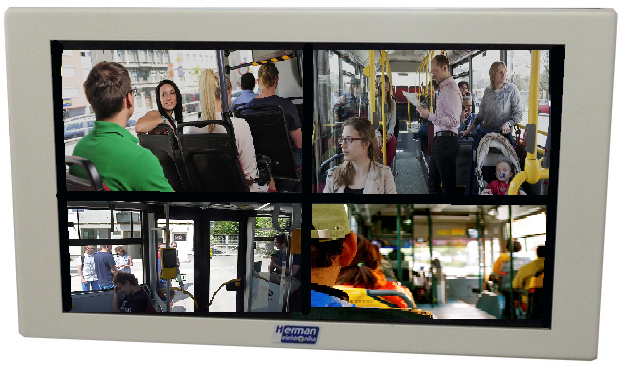 An LCD stop panel in the „SLIM” rendering – ELP 855A (a new solution with narrow edges) was used for the 55“size. An industrial Samsung TV equipped with our control was used for the 32“size. It was installed in the upright position. 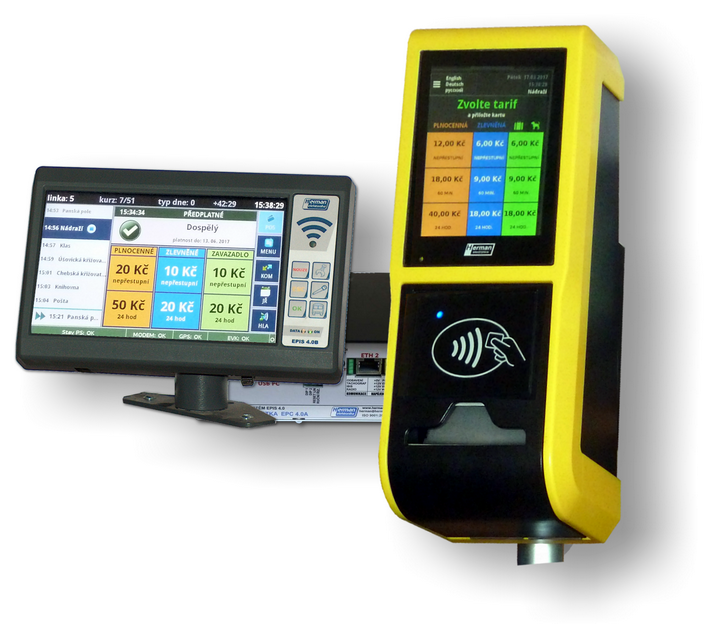 The new LCD panel solution includes multicolor line displaying, displaying a known stop and displaying current delays. Stops on the route are displayed in a very interesting way, they are listed in lower case under the target stop. 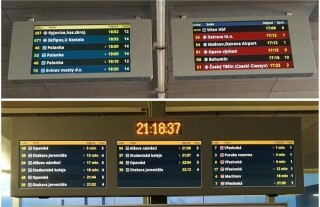 Delays are displayed in red color to ensure they are noticed quickly. Graphic design was made for LCD panels in the horizontal position - ELP 855AE (standard horizontal rendering) as well as for LCD panels in the vertical position – ELP 832 VE (vertical ordering) as can be seen in the picture. Protective glass can be added to standard monitors if needed. 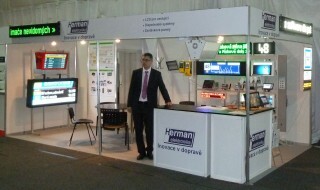 Herman company stand at the CzechBus 2016 in Prague. 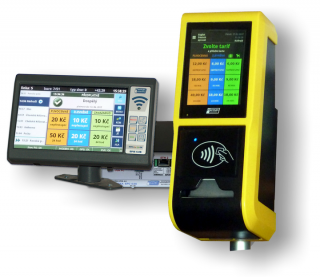 And other products such as validators EVK 50, on-board computers EPIS (line from 7“ to 10,4“), cash register, stop LCD, and others…. VCS 215 B-LW including an anchor and antennas. Channel for displaying transport information from the on-board computer. Herman company stand at InnoTrans 2016 in Berlin. Digital LED sign ELP 183. We prepared for production a new compact type of illuminated stop sign with an integrated LED panel with 3,8 mm LED spacing and readability from 15 m (the head of the sign does not have to be illuminated). the panels is called ELP 183. 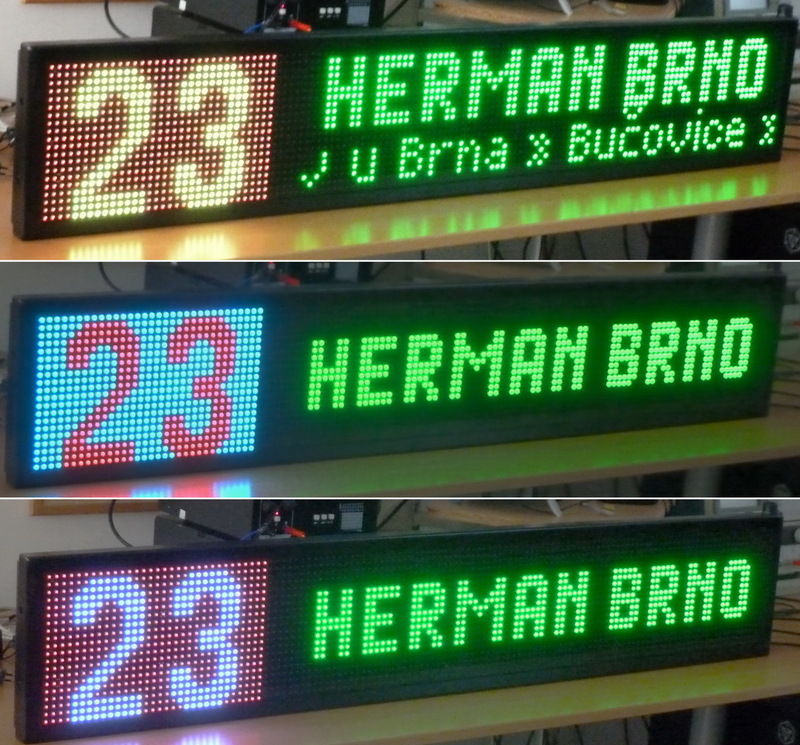 This sign conception as well as the 3,8 LED spacing was introduced for the first time in the Czech Republic. 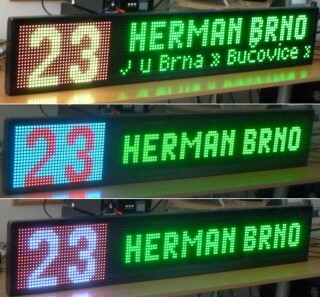 The LED panel can display 24 text signs, three lines (the number of lines can be modified if requested). The last line can be used as a dispatching line. The used LED diodes are the same as those used for our new outer vehicle panels of the VLP 19/20/24 line (type D) and they use „black“ LED capable of power consumption lowered by half and higher light while having much higher contrast. This LED technology ensures very good readability even in direct sunlight and is controlled based on the surrounding light. 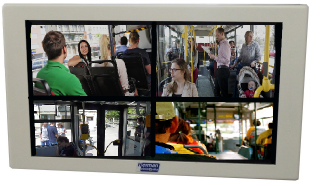 The panels can communicate with the dispatching center via a GSM/GPRS/UMTS network or via optic or Ethernet if used at a bus terminal. Thanks to their lower power consumption it is possible to use power supply from public lighting. When this power supply is used, embedded accumulators are charged at night and ensure correct function during the day. If requested this panel can be equipped with a command receiver for the vision impaired. Similar low cost panels can be supplied. These panels were first introduced at the international exhibition InnoTrans 2016 in Berlin from 20.9 to 23.9.2016. We developed new types of low input power vehicle outer full color LED panels VLP 19/20RGB or combined LED panels VLP 19K/20K. The panels consist of multi-color, or also single-color LED modules (combined RGB rendering – number and single-color text) controlled by a new panel control unit. In the case of the multi-color LED module it is possible to choose from 256 colors for each LED. 8 degrees of grey can be set on the single-color module. The price of the combined rendering is only 3 – 4 thousand Czech crowns higher than the price of the single color rendering. The fact that the panels are low input power is evidenced by the fact that the power consumption of the combined side panel in the picture was only 12W including its control unit when the picture was taken. The panels were introduced at the beginning of October 2016. Vehicle LCD - type VCS 156AE2 with a hard drive. We are preparing vehicle camera systems with the possibility of connecting up to 10 cameras and recording time of minimum 5 days and more. The basis of the system consists of a vehicle recording LCD (e.g. type VCS156AE2) equipped with a shock resistant hard drive with appropriate storage capacity. The system can be controlled either independently by external buttons or intelligently via the EPIS 4.x on-board computer. ECU 08P2 is used for this system which makes it possible for the cameras to be power supplied in accordance with the IEE 802.3af regime B standard. The system can also be used for joined trams. We are supplying 72 vehicle camera systems to DPO plc. in cooperation with Master IT plc..
Certification ISO 9001: 2008 – The company is certified ISO 9001: 2008 since 2008.